• For maximum restraint system protection, the seat belts must always be used whenever the vehicle is moving. • Seat belts are most effective when seatbacks are in the upright position. • Children age 12 and under must always be properly restrained in the rear seat. Never allow children to ride in the front passenger seat. If a child over 12 must be seated in the front seat, he/she must be properly belted and the seat should be moved as far back as possible. • Never wear the shoulder belt under your arm or behind your back. An improperly positioned shoulder belt can cause serious injuries in a crash. The shoulder belt should be positioned midway over your shoulder across your collarbone. • Avoid wearing twisted seat belts. A twisted belt can't do its job well. In a collision, it could even cut into you. Be sure the belt webbing is straight and not twisted. • Be careful not to damage the belt webbing or hardware. If the belt webbing or hardware is damaged, replace it. Seat belts are designed to bear upon the bony structure of the body, and should be worn low across the front of the pelvis or the pelvis, chest and shoulders, as applicable; wearing the lap section of the belt across the abdominal area must be avoided. It is essential to replace the entire assembly after it has been worn in a severe impact even if damage to the assembly is not obvious. Belts should not be worn with straps twisted. Each belt assembly must only be used by one occupant; it is dangerous to put a belt around a child being carried on the occupant's lap. As a reminder to the driver, the seat belt warning light will blink for approximately 6 seconds each time you turn the ignition switch ON regardless of belt fastening. If the driver's seat belt is not fastened when the ignition switch is turned on, the seat belt warning light and the seat belt warning chime will operate for approximately 6 seconds. But if it is fastened within the 6 seconds, the warning light will blink till the 6 seconds and the warning chime will turn off immediately. If the driver's seat belt is disconnected after the ignition switch is turned to the ON position, the seat belt warning light and chime will operate for approximately 6 seconds. But if it is fastened within the 6 seconds, the warning light and chime will turn off immediately. If the driver's seat belt is not fastened when the vehicle speed exceeds 10 km/h (6 mph), the seat belt warning light and chime will operate for approximately 11 times with a pattern of 6 seconds on and 24 seconds off until the belt is fastened or the vehicle speed decreases below 5 km/h (3 mph). Seat belt - Driver's 3-point system with emergency locking retractor To fasten your seat belt: To fasten your seat belt, pull it out of the retractor and insert the metal tab (1) into the buckle (2). There will be an audible "click" when the tab locks into the buckle. The height of the adjusting seat belt should not be too close to your neck. The shoulder portion should be adjusted so that it lies across your chest and midway over your shoulder near the door and not your neck. To raise the height adjuster, pull it up (1). To lower it, push it down (3) while pressing the height adjuster button (2). • Verify that the shoulder belt anchor is locked into position at the appropriate height. Never position the shoulder belt across your neck or face. Improperly positioned seat belts can cause serious injuries in an accident. 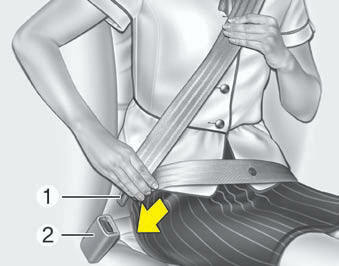 You should place the lap belt portion as low as possible and snugly across your hips, not on your waist. 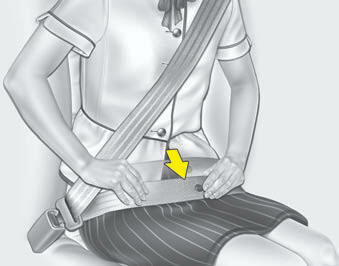 If the lap belt is located too high on your waist, it may increase the chance of injury in the event of a collision. Both arms should not be under or over the belt. Rather, one should be over and the other under, as shown in the illustration. Never wear the seat belt under the arm that is near the door. To fasten your seat belt: Combination retractor type seat belts are installed in the rear seat positions to help accommodate the installation of child restraint systems. Although a combination retractor is also installed in the front passenger seat position, it is strongly recommended that children always be seated in the rear seat. NEVER place any infant restraint system in the front seat of the vehicle. Although the combination retractor provides the same level of protection for seated passengers in either emergency or automatic locking modes, have the seated passengers use the emergency locking feature for improved convenience. The automatic locking function is intended to facilitate child restraint installation. To convert from the automatic locking feature to the emergency locking operation mode, allow the unbuckled seat belt to fully retract. Do NOT fold down the left portion of the rear seat back when the rear center seat belt is buckled. ALWAYS UNBUCKLE the rear center seat belt before folding down the left portion of the rear seat back. If the rear center seat belt is buckled when the left portion of the rear seat back is folded down, distortion and damage to the top portion of the seat back and seat belt garnish may result, causing the seat back to lock into the folded down position. 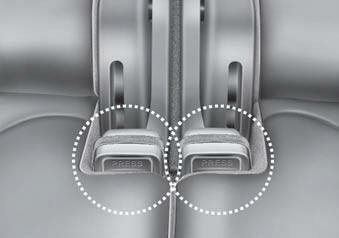 To release the seat belt: The seat belt is released by pressing the release button (1) in the locking buckle. When it is released, the belt should automatically draw back into the retractor. Stowing the rear seat belt The rear seat belt buckles can be stowed in the pocket between the rear seatback and cushion when not in use. Routing the seat belt webbing through the rear seat belt guides will help keep the belts from being trapped behind or under the seats. 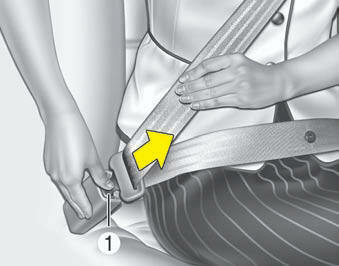 After inserting the seat belt, tighten the belt webbing by pulling it up. When using the seat belt, use it after taking it out of the guides. If you pull the seat belt when it is stored in the guides, it may damage the guides and/or belt webbing. Pre-tensioner seat belt Your vehicle is equipped with driver's and front passenger's pre-tensioner seat belts. The purpose of the pre-tensioner is to make sure that the seat belts fit tightly against the occupant's body in certain frontal collisions (or side collisions or rollovers). The pre-tensioner seat belts can be activated, where the frontal collision (or side collisions or rollovers) is severe enough, together with the air bags. When the vehicle stops suddenly, or if the occupant tries to lean forward too quickly, the seat belt retractor will lock into position. In certain frontal collisions (or side collisions or rollovers), the pretensioner will activate and pull the seat belt into tighter contact against the occupant's body. 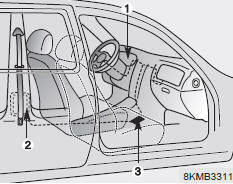 The pre-tensioner will activate not only in a frontal collision but also in a side collision or rollover, if the vehicle is equipped with a side or curtain air bag. The seat belt pre-tensioner system consists mainly of the following components. To obtain maximum benefit from a pre-tensioner seat belt: 1. The seat belt must be worn correctly and adjusted to the proper position. Please read and follow all of the important information and precautions about your vehicle’s occupant safety features – including seat belts and air bags – that are provided in this manual. • Both the driver's and front passenger's pre-tensioner seat belts may be activated in certain frontal collisions. • Although it is harmless, the fine dust may cause skin irritation and should not be breathed for prolonged periods. Wash all exposed skin areas thoroughly after an accident in which the pre-tensioner seat belts were activated. Because the sensor that activates the SRS air bag is connected with the pretensioner seat belt, the SRS air bag warning light ( ) on the instrument panel will illuminate for approximately 6 seconds after the ignition switch has been turned to the ON position, and then it should turn off. • Do not attempt to inspect or replace the pre-tensioner seat belts yourself. This must be done by an authorized KIA dealer. • Do not attempt to service or repair the pre-tensioner seat belt system in any manner. • Do not put anything near the buckle. Placing objects near the buckle can adversely affect the buckle pretensioner and may increase the risk of personal injury in the event of a collision. • If the vehicle or pre-tensioner seat belt must be discarded, contact an authorized KIA dealer. All occupants of the vehicle must wear their seat belts at all times. Seat belts and child restraints reduce the risk of serious or fatal injuries for all occupants in the event of a collision or sudden stop. Without a seat belt, occupants could be shifted too close to a deploying air bag, strike the interior structure or be thrown from the vehicle. Properly worn seat belts greatly reduce these hazards. Infant or small child You should be aware of the specific requirements in your country. Child and/or infant seats must be properly placed and installed in the rear seat. For more information about the use of these restraints, refer to “Child restraint system” in this section. Every person in your vehicle needs to be properly restrained at all times, including infants and children. Never hold a child in your arms or lap when riding in a vehicle. 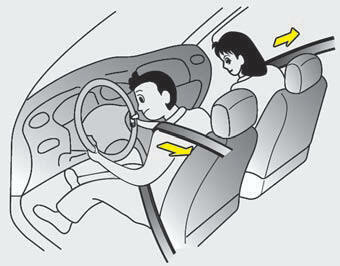 The violent forces created during a crash will tear the child from your arms and throw the child against the interior. Always use a child restraint appropriate for your child's height and weight. Small children are best protected from injury in an accident when properly restrained in the rear seat by a child restraint system that meets the requirements of the Safety Standards of your country. Before buying any child restraint system, make sure that it has a label certifying that it meets the Safety Standard of your country. The restraint must be appropriate for your child's height and weight. Check the label on the child restraint for this information. Refer to “Child restraint system” in this section. Children who are too large for child restraint systems should always occupy the rear seat and use the available lap/shoulder belts. The lap portion should be fastened and snugged on the hips and as low as possible. Check if the belt fits periodically. A child's squirming could put the belt out of position. Children are given the most safety in the event of an accident when they are restrained by a proper restraint system in the rear seat. If a larger child (over age 12) must be seated in the front seat, the child should be securely restrained by the available lap/shoulder belt and the seat should be placed in the rearmost position. Children age 12 and under should be restrained securely in the rear seat. NEVER place a child age 12 and under in the front seat. NEVER place a rear facing child seat in the front seat of a vehicle. Restraint of pregnant women Pregnant women should wear lap/shoulder belt assemblies whenever possible according to specific recommendations by their doctors. The lap portion of the belt should be worn AS SNUGLY AND LOW AS POSSIBLE. A seat belt should be used when an injured person is being transported. When this is necessary, you should consult a physician for recommendations. Two people (including children) should never attempt to use a single seat belt. This could increase the severity of injuries in case of an accident. To reduce the chance of injuries in the event of an accident and to achieve maximum effectiveness of the restraint system, all passengers should be sitting up and the front and rear seats should be in an upright position when the vehicle is moving. A seat belt cannot provide proper protection if the person is lying down in the rear seat or if the front and rear seats are in a reclined position. Riding with a reclined seatback increases your chance of serious or fatal injuries in the event of a collision or sudden stop. The protection of your restraint system (seat belts and air bags) is greatly reduced by reclining your seat. Seat belts must be snugged against your hips and chest to work properly. The more the seatback is reclined, the greater the chance an occupant's hips will slide under the lap belt causing serious internal injuries. Also, the shoulder belt may strike the occupant's neck. Drivers and passengers should always sit well back in their seats, properly belted, and with the seatbacks upright. When you return the rear seatback to its upright position after the rear seatback has been folded down, be careful not to damage the seat belt webbing or buckle. Be sure that the webbing or buckle does not get caught or pinched in the rear seat. A seat belt with damaged webbing or buckle could possibly fail during a collision or sudden stop, resulting in serious injury. If the webbing or buckles are damaged, get them replaced immediately. All seat belts should be inspected periodically for wear or damage of any kind. Any damaged parts should be replaced as soon as possible. Keep belts clean and dry Seat belts should be kept clean and dry. If belts become dirty, they can be cleaned by using a mild soap solution and warm water. Bleach, dye, strong detergents or abrasives should not be used because they may damage and weaken the fabric. When to replace seat belts The entire in-use seat belt assembly or assemblies should be replaced if the vehicle has been involved in an accident. This should be done even if no damage is visible. 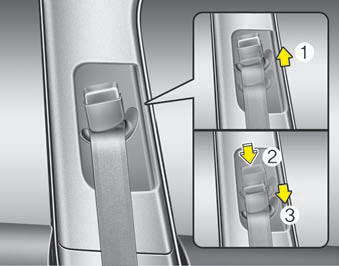 Additional questions concerning seat belt operation should be directed to an authorized KIA dealer.